Thank you to everyone who was able to join us for the WebCast today! It was massively successful (but we already knew it would be, right?) with well over 500 simultaneous participants at its peak. In fact, there were so many people that joined that we really began to tax the Microsoft Live Meeting streaming server and many of you ran into audio problems as a result. Well have no fear. You won't miss a thing. Joe Stagner will be posting the recorded version of today's live WebCast on his blog early next week and I have a special pre-recorded version of today's WebCast available for you now! That's right, for those of you who move at the speed of business and can't wait for next week's recording, check out my pre-recorded version on Screencast.com today (PowerPoint slides from today's WebCast are available there, too). Based on the success of today's event, we'll probably try to arrange another "Live from Redmond" WebCast with Joe soon. Watch my blog for details and in the mean time enjoy the WebCasts! UPDATE: Well, the popularity of this content has not stopped. I think we have blown through my allotted bandwidth on Screencast.com, so I'm scrambling to get more bandwidth. If you're having trouble watching this WebCast, check back soon and I'll post an update when more bandwidth is available. UPDATE 2: I'm still working with Screencast on the bandwidth issues, but in the mean time you can access the live recorded version of this WebCast on Microsoft's website. Check out this new post for all the details. Sorry for the trouble! I think we may have exceeded the bandwidth that Screencast alloted for my account. I am trying to work with their support team to get a definitive answer (their service is still in beta) and hope to have more bandwidth available soon. I'll post an update as soon as I know more. Microsoft's ASP.NET 2.0 TreeView control does not work inside an AJAX Update Panel (see ajax.asp.net). 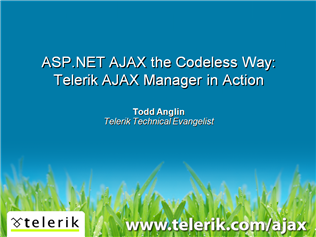 Will it work properly with your AJAX Manager, or would I need to purchase Telerik's TreeView control?